July 2 is the 183rd day of the year(184th in leap years) in the Gregorian calendar.There are 182 days remaining until the end of the year. 1816 – The French frigate Méduse struck the Bank of Arguin and 151 people on board had to be evacuated on an improvised raft, a case immortalised by Géricault's painting The Raft of the Medusa . 1839 – Twenty miles off the coast of Cuba, 53 rebelling African slaves led by Joseph Cinqué take over the slave ship Amistad . Year 437 (CDXXXVII) was a common year starting on Friday of the Julian calendar. At the time, it was known as the Year of the Consulship of Aetius and Sigisvultus. The denomination 437 for this year has been used since the early medieval period, when the Anno Domini calendar era became the prevalent method in Europe for naming years. 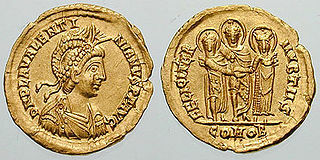 Valentinian III was Western Roman Emperor from 425 to 455. His reign was marked by the ongoing dismemberment of the Western Empire. Year 419 (CDXIX) was a common year starting on Wednesday of the Julian calendar. At the time, it was known as the Year of the Consulship of Monaxius and Plinta. 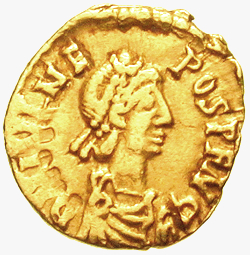 The denomination 419 for this year has been used since the early medieval period, when the Anno Domini calendar era became the prevalent method in Europe for naming years. Year 1363 (MCCCLXIII) was a common year starting on Sunday of the Julian calendar. Maria was Queen of Sicily and Duchess of Athens and Neopatria from 1377 until her death. Li Jiancheng (Chinese: 李建成; pinyin: Lǐ Jiànchéng; 589 – July 2, 626, formally Crown Prince Yin, nickname Pishamen, was the first crown prince of the Chinese dynasty Tang Dynasty. He was the oldest son of the founding emperor Emperor Gaozu and the crown prince after the founding of the dynasty in 618. Li Jiancheng was murdered by his younger brother, Li Shimin, the Prince of Qin during Xuanwu Gate indident in 626. All of Li Jiancheng's sons were executed and excluded from imperial clan. After Li Shimin took the throne, Li Jiancheng was posthumously stripped of his crown prince status and granted the title "Prince Yin of Xi". Later, he was buried with ceremonies due an imperial prince. In 642, Li Jiancheng's crown prince title was restored as the crown Prince of Yin. Li Yuanji (李元吉), formally Prince La of Chao (巢剌王), more commonly known by the title of Prince of Qi (齊王), nickname Sanhu (三胡), was an imperial prince of the Chinese Tang Dynasty. He was a son of the dynasty's founder Emperor Gaozu of Tang, and in the intense rivalry developed between his older brothers Li Jiancheng the Crown Prince and Li Shimin the Prince of Qin, he sided with Li Jiancheng and often advocated drastic actions against Li Shimin, including assassination. In 626, Li Shimin, fearing that Li Jiancheng and Li Yuanji were about to kill him, laid an ambush for them at Xuanwu Gate outside the palace and killed them. Li Shimin then effectively forced Emperor Gaozu to yield the throne to him. Aberoh and Atom are martyrs of the Christian church. Saint Bernardino Realino was an Italian Roman Catholic priest and a professed member of the Jesuits. His entire career was devoted to the areas of Naples and Lecce. Realino pursued a career in law and served in several municipal capacities before feeling called to the Jesuit life and being ordained to the priesthood in Naples. He is often dubbed as the "Apostle of Lecce" for his commitment to the poor and for his preaching abilities. The Visitation is the visit of Mary to Elizabeth as recorded in the Gospel of Luke, Luke 1:39–56. It is also the name of a Christian feast day commemorating this visit, celebrated on 31 May in the West and 30 March among Eastern Christians. ↑ "Tom Springfield – Music Biography, Credits and Discography". AllMusic. 2 July 1934. Retrieved 6 January 2013. ↑ "Polly Holliday Biography (1937-)". Filmreference.com. 2010. Retrieved 2010-11-17. ↑ "Larry David Biography". TVGuide.com. Archived from the original on July 18, 2012. ↑ Robert Paquette, The Canadian Encyclopedia. ↑ ""Hell Hath No Fury like a Drag Queen Scorned": Sylvia Rivera's Activism, Resistance, and Resilience · Challenging Gender Boundaries: A Trans Biography Project · outhistory.org". outhistory.org. Retrieved 2018-06-01. ↑ "Jerry Hall featured article: TheGenealogist" . Retrieved September 4, 2015. ↑ "Darren Shan Biography". Darrenshan.com. Retrieved 2008-06-06. ↑ "Kristan Michal". Justice Ministry. Archived from the original on 8 February 2012. Retrieved 11 September 2012. ↑ "Lindsay Lohan's chequered life in the spotlight". BBC. July 7, 2010. Retrieved December 28, 2016. ↑ "Madison CHOCK / Greg ZUERLEIN: 2010/2011". International Skating Union. Archived from the original on July 19, 2011. ↑ "5 things about Vince Staples". Atlanta Journal Constitution . Retrieved November 22, 2018. Wikimedia Commons has media related to July 2 .